I came across a program called Easy Cash Club that claims it can help you make $2,000 per day using a revolutionary software. You may also have visited their site and watched their sales video and found their program to be an excellent opportunity you want to take advantage of this year. 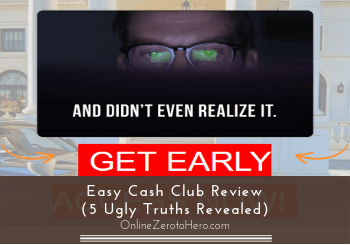 But since you want to know more about the program before you make the final decision, you decided to do your own research and found my Easy Cash Club review. I want to welcome you to my in-depth review of this program, where I will share with you all the information I’ve gathered about their system. I hope this review will provide you with the means to make an informed decision about this program – there are definitely some things you NEED to know before joining! 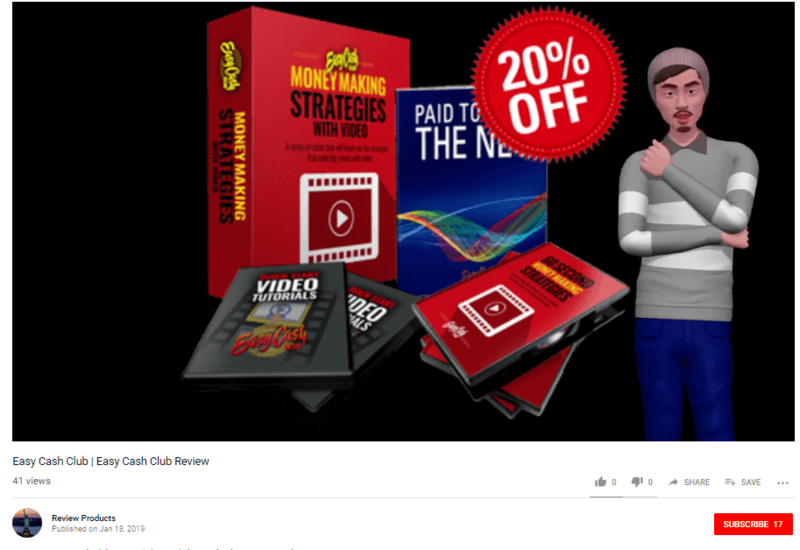 Easy Cash Club is a program that claims it can help you make $2,000 per day using a revolutionary software that can easily create videos for affiliate marketing. The so-called creator of this program is Steve Johnson and according to him you don’t need any website or technical skills to create videos that you will use on YouTube. Basically, Easy Cash Club will be focusing on promoting affiliate offers using the videos generated by their software. But you need to understand that creating the videos is just one of the tasks you need to do. You’ll also need to search for a suitable product to promote and to create an affiliate account on that particular company. In general, I don’t recommend this program because it has several red flags, that, in my opinion, makes it a risky investment. It’s better to look for other legit opportunities online that can genuinely provide you the results you’re looking for. What is Easy Cash Club and what does it offer? 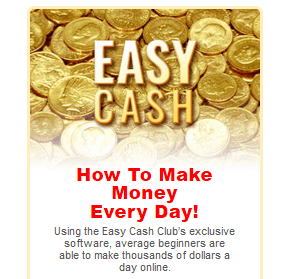 The first time I visited Easy Cash Club sales page, I was a bit skeptical when I saw the claim that this program will rely on an automated software that can quickly generate money online. Steve Johnson, the so-called owner of this program, explains how his software can help you earn affiliate commission through YouTube videos. He makes it sound very promising because you don’t need any technical skills or prior experience in online marketing to succeed with their program. He also explains that the videos you will upload on YouTube will be created by their revolutionary software that will transform any text content into a profit-generating video. They claim that you can easily make money through their software. He also highlights the AI voice on the generated videos will be human-like, so it doesn’t sound like a robot. You can only imagine that their so-called software is the future of video marketing because it can produce top-notch videos without exerting too much effort in editing the videos. In my opinion, they are hyping their software to lure more people into the program, because in reality, there’s NO such thing as automated software that can do everything for you. To succeed in any online endeavor, you need to invest time, effort a bit of patience since it will take some time before you see the results. But let’s take a deeper look at why I think you should be careful about investing money in Easy cash Club. Based on their sales video, it seems everyone can easily make money online using their so-called automatic software. The way they advertise their program will really catch your attention because they claim that you don’t need any website or technical skills to create a decent income online. This is the very reason why I wrote this Easy Cash Club review, so I can present to you the red flags I think you should know about. The main highlight of this program is their software that can supposedly create high-quality videos for YouTube. There are several instances this software is highlighted on their sales video, and Steve claims that it will do everything for you, so you’ll rely 100% on this software. In my opinion, a program that heavily relies on automated tools will not prosper in the long run since there are risks involved in using these tools. Also, Steve explains that you will be using the videos to promote other people’s product, which means their program will also use affiliate marketing to earn money online. If you’re still new to affiliate marketing, it is a legit business model that lets you promote products and services created by business owners online. You’ll get a commission when people buy those products through your affiliate link. But if your videos were created by a software, you can’t be sure if it can compete with videos produced by professional video editors. There are millions of amazing videos created every day, and it will, in my opinion, be difficult to compete with this with automatically generated videos with no personality. The software can help you make videos, so I am not saying it is not technically possible. I am just saying that they usually sound and look like they are created by a robot (which they are) and with all the great videos out there, people will in most cases not watch videos like this. Not to mention that Steve wants you to believe that their AI can mimic the human voice, which in my opinion, is not that accurate because I watched one of the videos they have published on YouTube and the voice of their AI in that video is still robotic. The video they posted on YouTube still has that robotic voice. People will not connect to this and most likely just leave the video – I know I personally always leave right away when I hear a video has this robotic voice. Online marketing is very much about creating valuable content and connecting with your audience. Robotic voice videos that are automatically created will not do this – at least not how technology is so far and the way they are made with Easy cash Club from what I can see. I hope you’ll take this red flag seriously before you make your decision about this program. According to Steve, it’s easy to use their software, and you’ll only need 60 seconds to create the videos. He will also claim that you don’t need any technical skills to set up the content on the software, because it will do everything for you. Honestly, this is NOT something a newbie can do without proper training, and it will take you more than 60 seconds to set up everything in your campaign. They claim that you can easily make money in 60 seconds or less. In my opinion, the claim that you can easily set up everything in 60 seconds or less is unrealistic, because in affiliate marketing you’ll need to invest some of your time, effort and a bit of patience to succeed. Also, it’s imperative to know the basics of affiliate marketing before you choose a relevant affiliate product and find the best affiliate program based on your own interests. Again, this is another red flag that you need to consider before making your final decision. On their sales page, you will notice that there are written testimonials with photos of their so-called successful customers. They even showed the income of their so-called customers on those testimonials, so if you’re not careful enough you will think that these are real people. I’m a bit skeptical, so I did some investigation on some of the photos on those testimonials, and I found out that some of the images there are stock images or photos of people randomly taken from other articles. In fact, the photo of “Julie” on their testimonial is really “Amy” in real life, a woman known to be paid $80 an hour to cuddle random people. Here’s some proof I got when I did my own research.